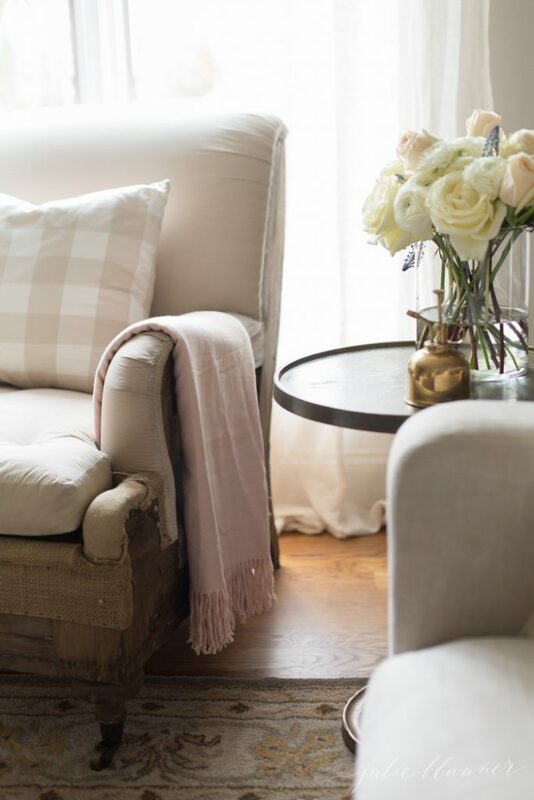 Spring home decorating ideas, tips and tricks to transition your home from winter. I’m always anxious for spring, even when the weather is a little confused. If there’s a 70 degree day in January, you’re likely to find me in flip flops, soaking up a little sun with a smile. If not, you’re probably going to find me indoors living in bliss pretending that its’ 70 degrees and sunny outside. 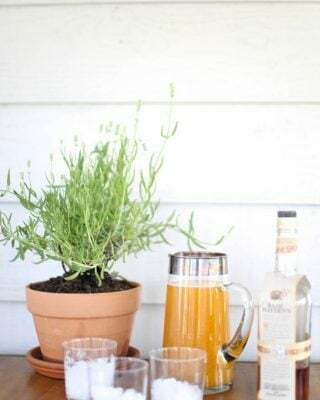 No matter the weather, today I’m sharing 10 spring home decorating ideas so that you can do the same. I’m excited to share with you in collaboration with Country Living magazine. 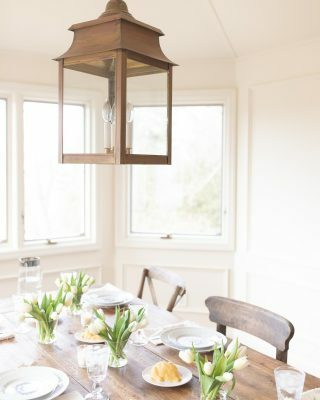 Spring home decorating always makes a home feel fresh. It fills the void that is left after Christmas, softens your home and makes it feel light and airy, like a spring breeze. 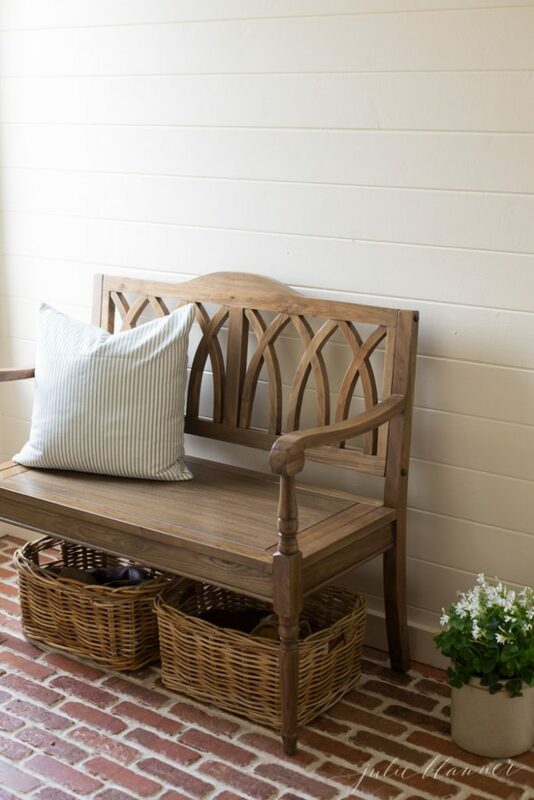 That’s why I’m sharing 10 Ways to Bring Spring into Your Home! 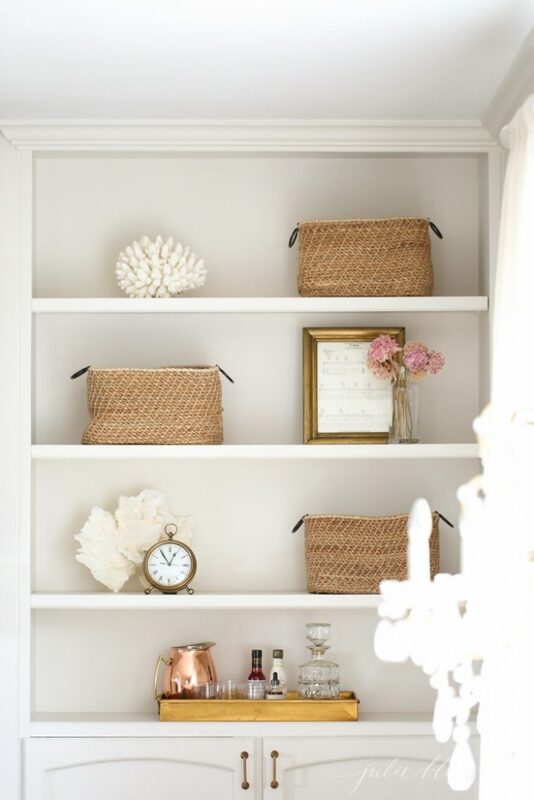 My first step to spring decorating is to declutter. 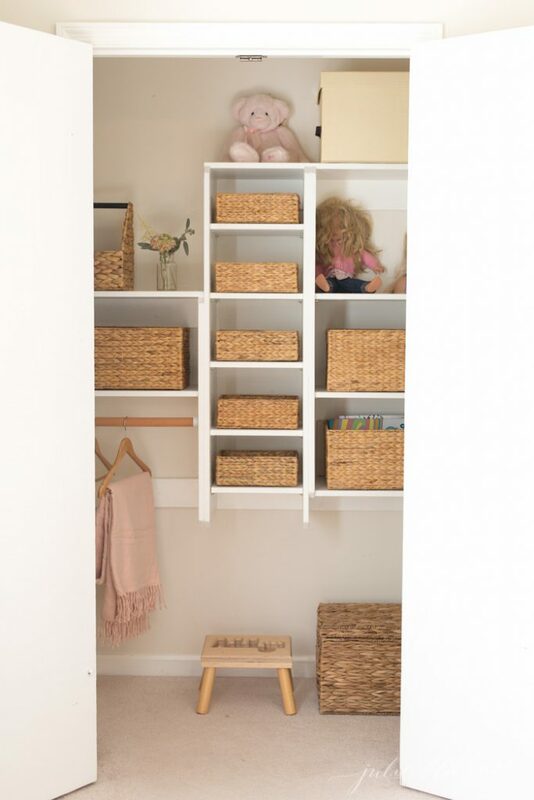 There’s nothing that makes your home feel lighter than eliminating clutter, unwanted toys, clothes and decor. It’s the perfect way to spend a chilly day (because I know you won’t want to do it when it’s gorgeous outside), but it’s always worth it. 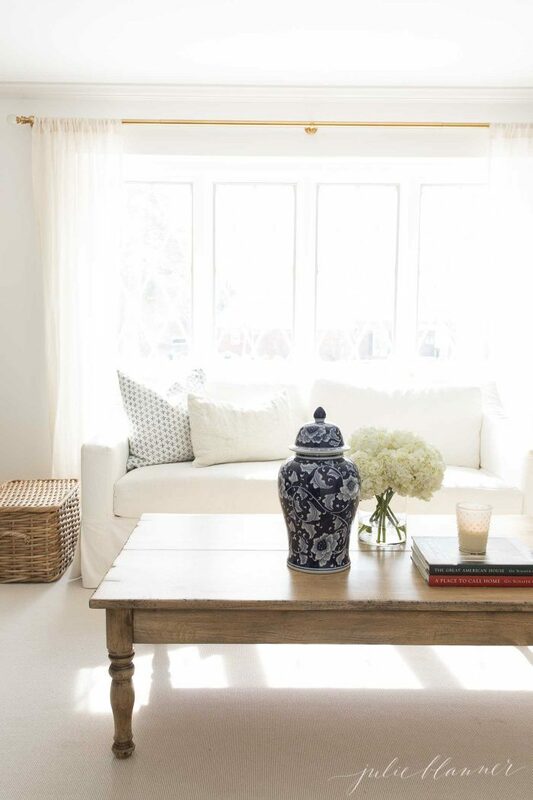 Decluttering allows you to focus your eye on the decor you have. You can get my decluttering tips (and checklist ) here. PS you can always shop our home! 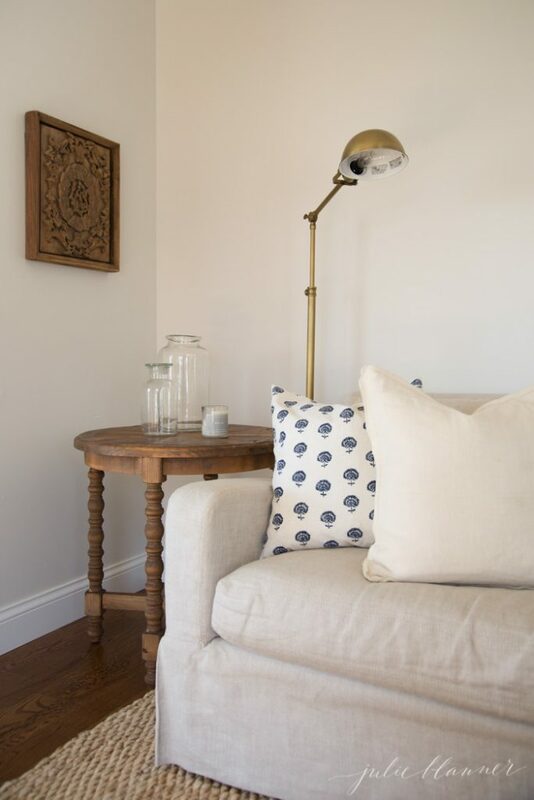 Spring is my favorite time of the year to introduce color – soft blue hues, pastel pinks and hints of lavender can all be found in our home this year. Just as flowers bloom outdoors, I bring some in as well. 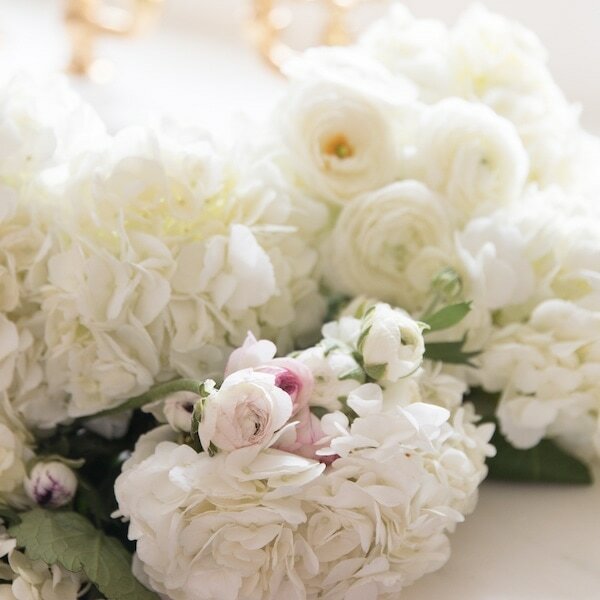 Fresh flowers bring a room to life, so add some plants and/or fresh cut blooms throughout your home. 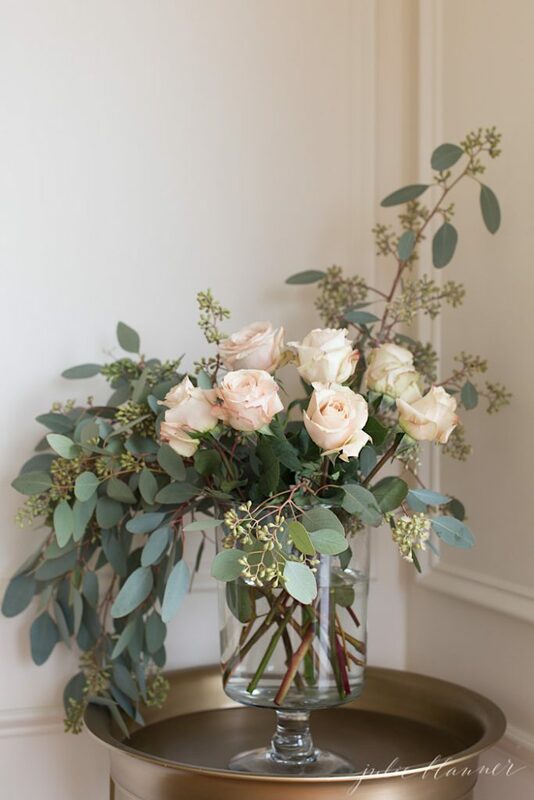 You can learn how to arrange flowers here. 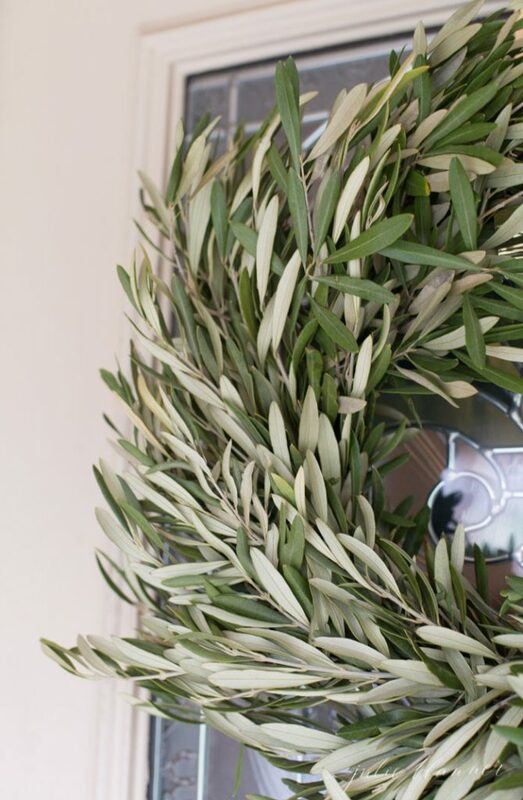 Greet guests and passerbys with a beautiful fresh or dried wreath. Most fresh wreaths dry beautifully if in a covered location. 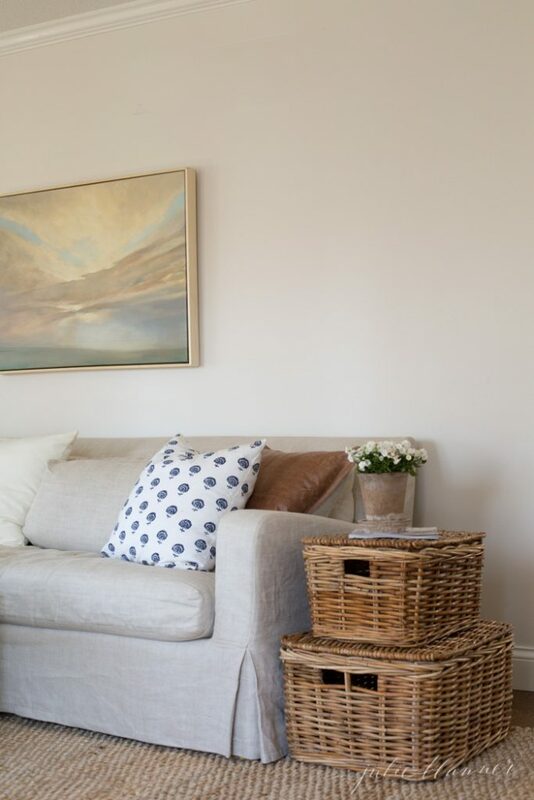 Another easy spring home decorating idea is to update your artwork. 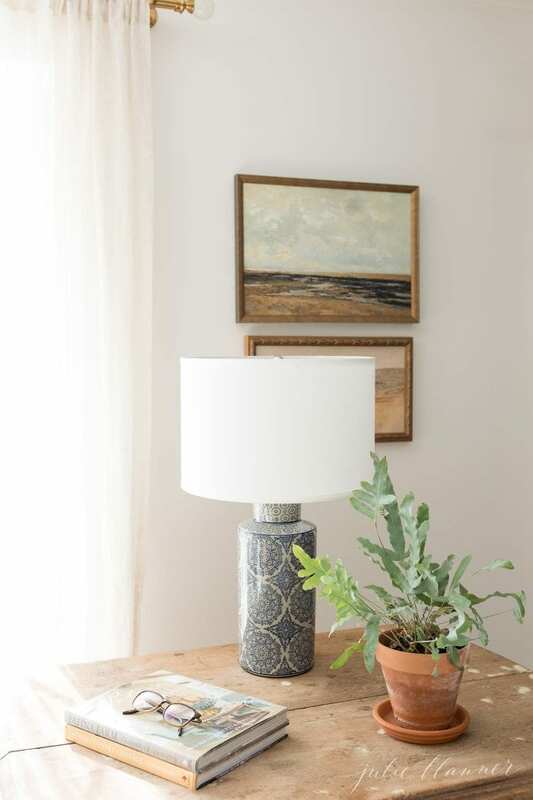 I have 17 easy art ideas for your home. You can also download these pretty egg prints here! 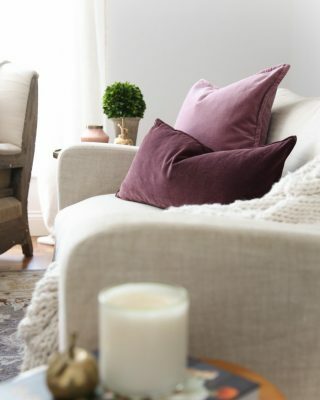 One of my favorite ways to transition our home through the seasons is by changing our pillow covers and throws. 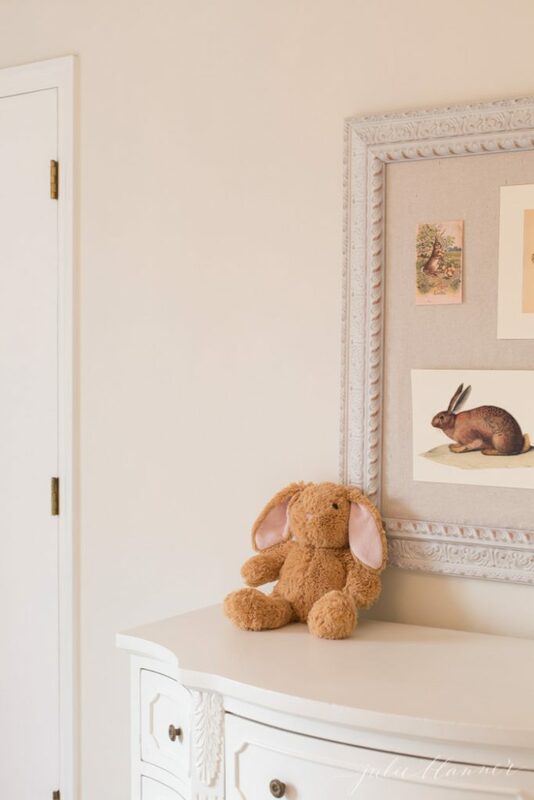 I added this sweet little bunny pillow cover in Adalyn’s room for an instant spring fix! I store out-of-season covers and throws in our linen cabinet. 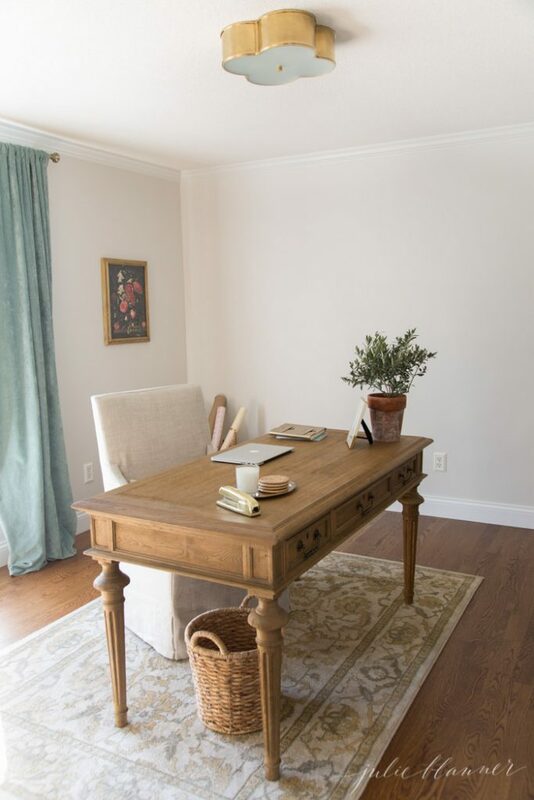 Her desk is actually a console table that we cut the legs down to accommodate her. Through the year, I update little accents throughout our home, especially in our bookcases. I still haven’t decided exactly how I want to decorate our bookcases for spring, sooooo, I fast forward to summer, but they’re light and beautiful to me, so that’s all that matters. 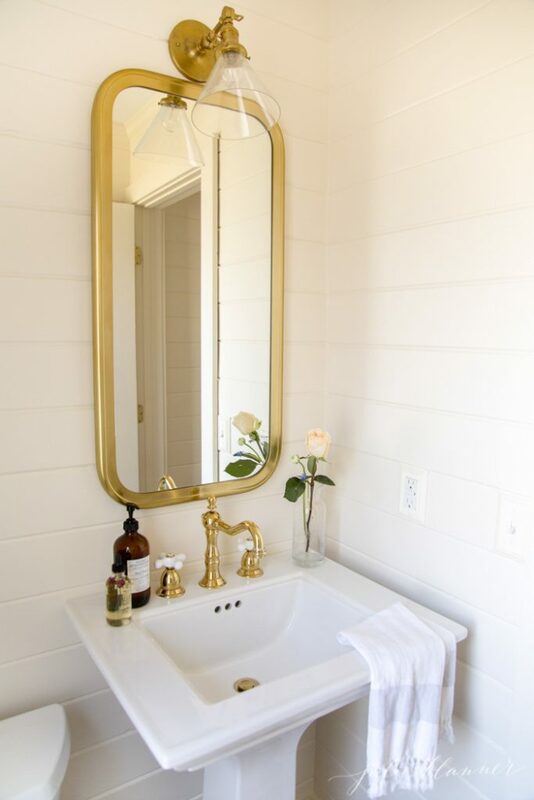 Another easy spring refresh idea is adding your favorite spring scents to powder rooms. After all, who doesn’t let the smell of spring? Lavender, peonies, roses, oh my! 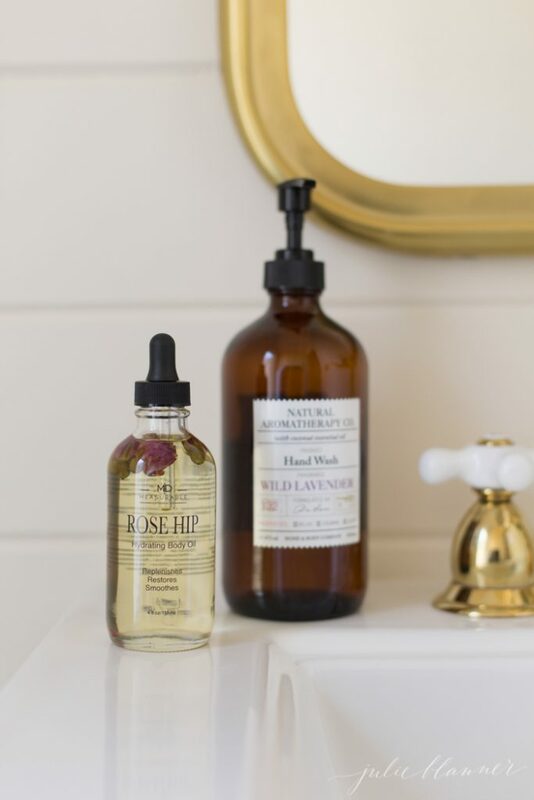 I also added rose infused oil to our powder room to rid my cuticles any memories of winter. Hand towels need to be replaced more frequently than other linens. Eliminating towels are worn, tired or soiled is part of my spring cleaning routine. 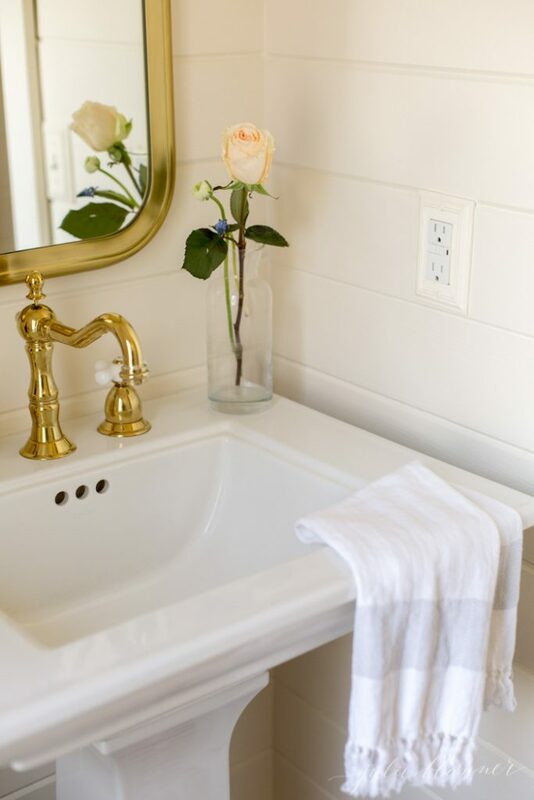 Replacing hand towels is one of my favorite spring home decorating ideas. 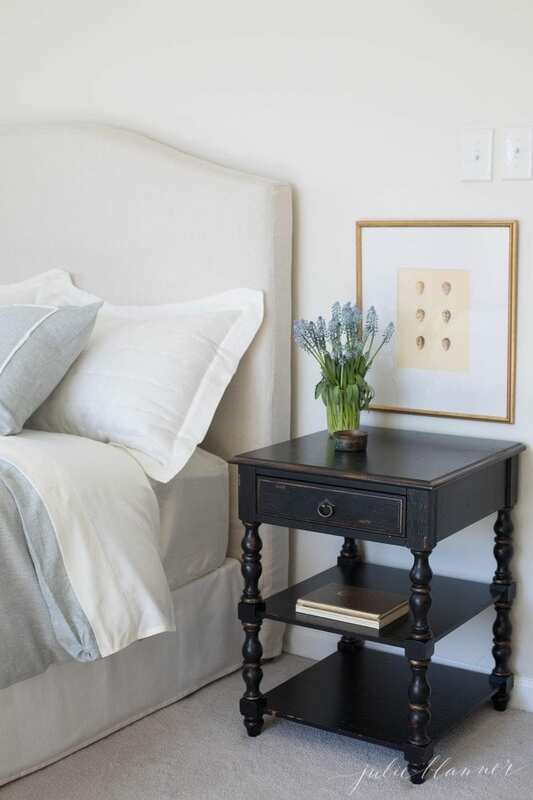 They’re often really inexpensive and offer a nice impact for minimal effort. 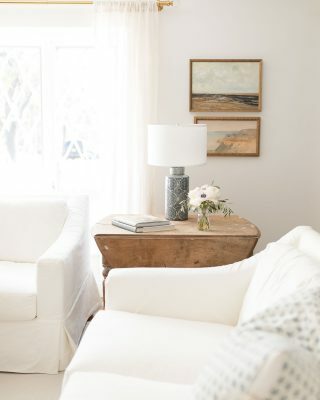 One of the quickest, easiest ways you can do is shop your own home and redecorate a coffee or side table! It doesn’t stop there! You can see our spring home (in 2018) below! I love olive trees, so I added a third to my office. I just love their two-toned silverly leaves and a little patina on the pot never hurts either! Even though I just refreshed, I plan to do a pillow cover change again to work with the painting. 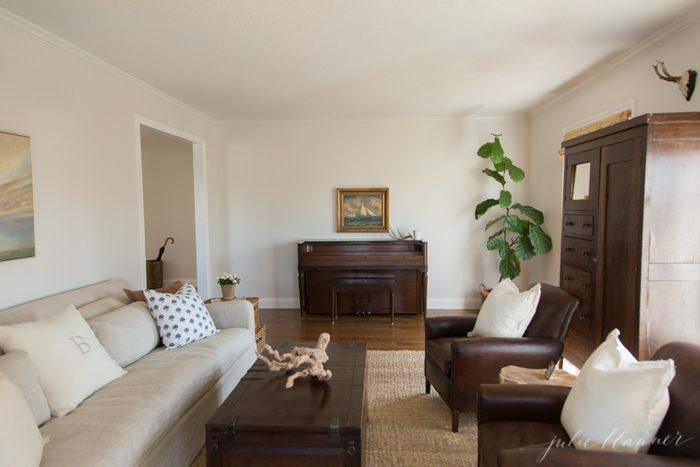 Our family room is a blend of old and new, with family heirlooms, a trunk that I don’t love, but love the storage it provides. It’s feeling better every day! 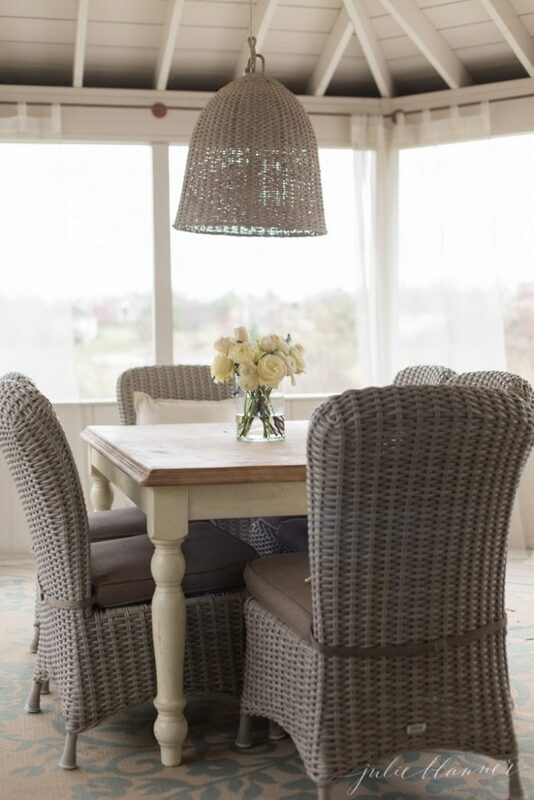 Just outside the family room is our screened in porch where we frequently enjoy spring dinners. 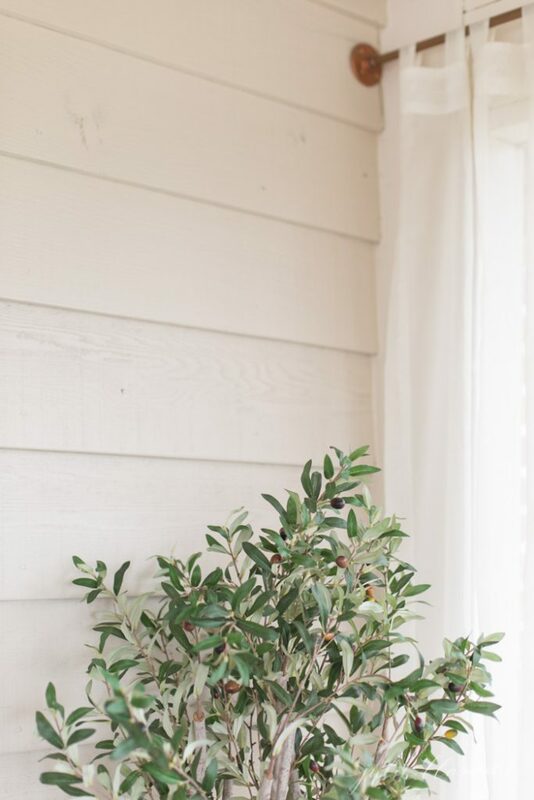 I’m still loving this faux olive tree from a few years ago. Want to see the basement? Just kidding, it’s a disaster down there! Spring break and spring home tours just don’t mix. 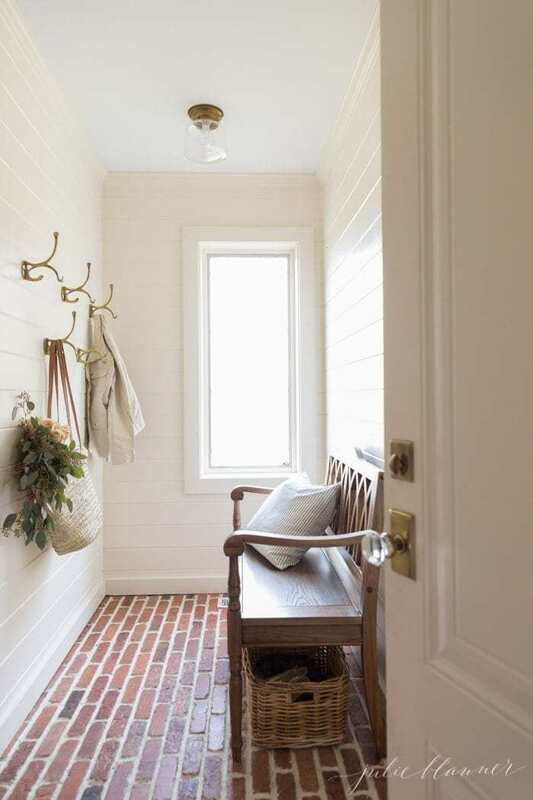 Since we’re friends, want to leave through the garage to catch one last glimpse of the mudroom? I love these clover plants available at Trader Joe’s and often your local grocery store in March! THe house looks perfect! Im inspired to return from spring break and getting started. Thank you, friend! I’m excited for you to come home to your almost new home! It looks so inviting and ready for Spring! 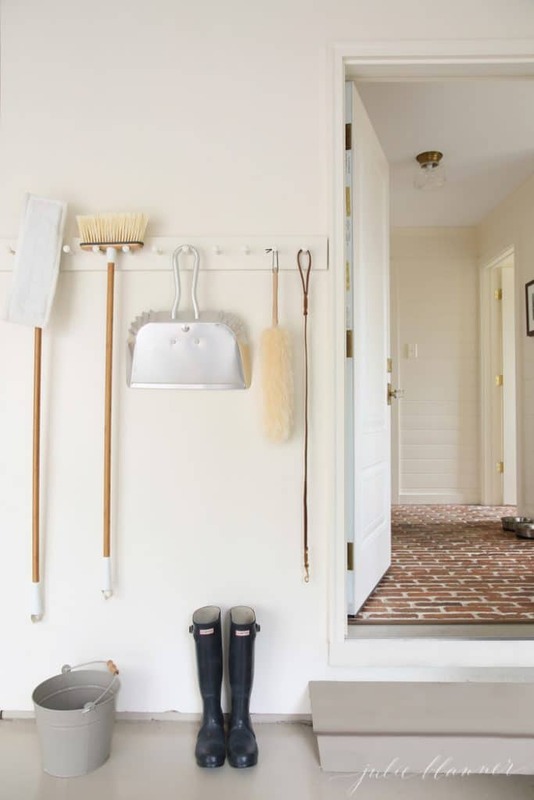 I’d love to get my hands on a set of those mudroom hooks, do you remember where you found them? At a local boutique that no longer carries them – I have searched high and low for more to no avail. Sorry! Darn! Thanks for replying. I’ll have to keep my eyes peeled for something similar. Julie this tour was gorgeous, I loved taking in every detail and thought you put into your spaces… And you are a girl after my own heart with your organization! Everything is so lovely and leaves me inspired every visit I make – xo! Julie, I’m completely in love with two spaces the most– your mushroom (the simplicity makes me really notice the quality of everything present), and adalyn’s room. So smart to cut those legs down to make it perfect for her! And the light– you are right! It totally feels warm and cozy. So funny about your basement comment haha! Thank you for joining the hop and thank you for taking the time to comment on everyone’s blog. I know that takes a lot of time but it was so appreciated. Beautiful home, Julie. I’m swooning over your brick floor! I agree with you about de-cluttering. 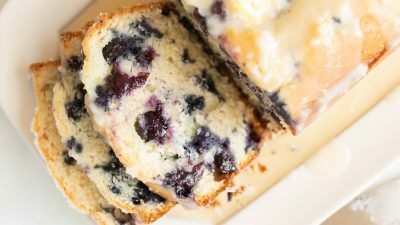 It’s one of the best ways to freshen up your home no matter what the season. Thanks for the gorgeous tour! I chose it because it’s a little more refined than shiplap. You can read more about it here. Enjoy! 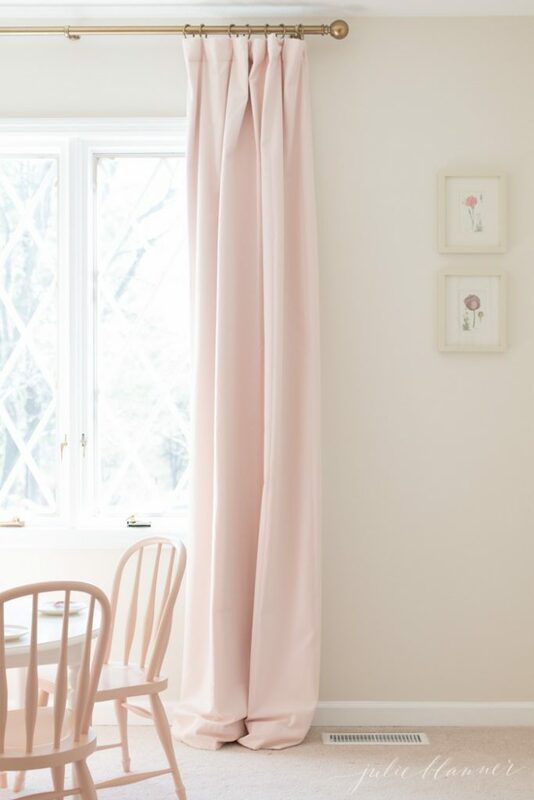 I love the blush pink curtains in your daughters room! Where are they from? Hi Shelley! They’re from RH Baby and Child. Enjoy! Julie your home is so warm and soft feeling. I love your subtle decor, it’s all so pretty! Julie – This is soooo beautiful! I love all of your ideas. Thank you for sharing. Thank you, Holly! Happy Spring! 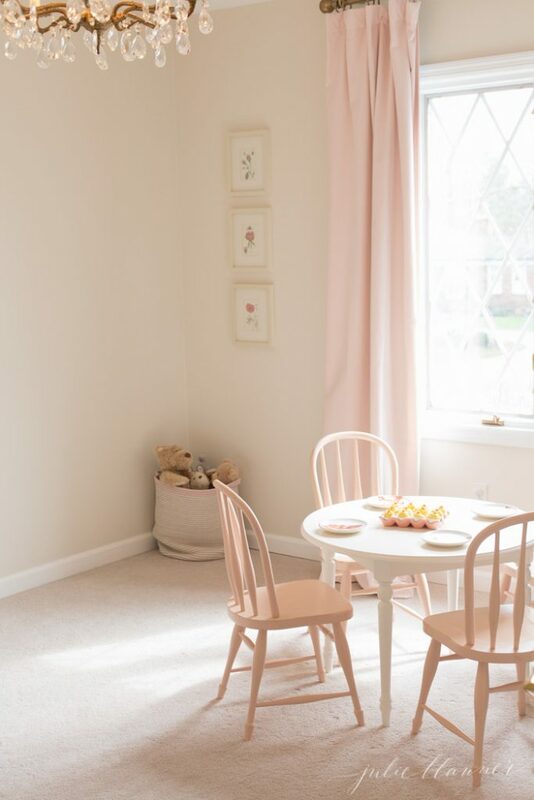 Your daughter’s room is beautiful! Where did you find the rabbit pillow, or is the fabric available? It’s perfect fro spring. 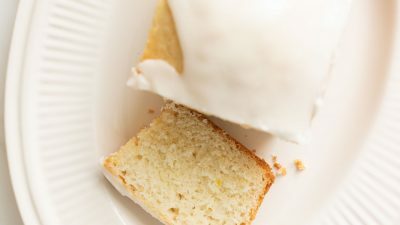 Peony and Sage – proceed with caution, it’s all irresistibly sweet! So ready for full-time spring! This back and forth weather in MO is dragging me down. 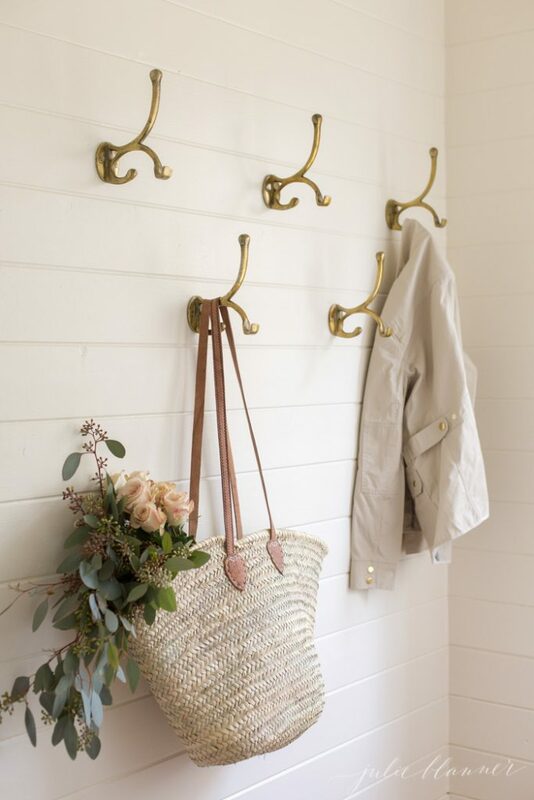 Where did you get the brass hooks in your mudroom? I’ve been looking for something similar. I know! I found them at K Hall Designs, but sadly they no longer offer them. The snow has liquefied, and our home is encompassed by an exquisite garden of cocoa grass and exposed branches. Spring is here, however it appears that winter is as yet attempting to take the show. I end up searching for green buds and delicate breezes that are not yet prepared to arrive. Your home is so gorgeous, Julie! I’m in love with all your spring touches and everything you do. Thank you, friend, you’re too sweet! Where do you find Eucalyptus with seeds, real or fake? Your house is lovely! Real! I usually get it at Trader Joe’s, but our local grocery store and Whole Foods also carries them. Enjoy! 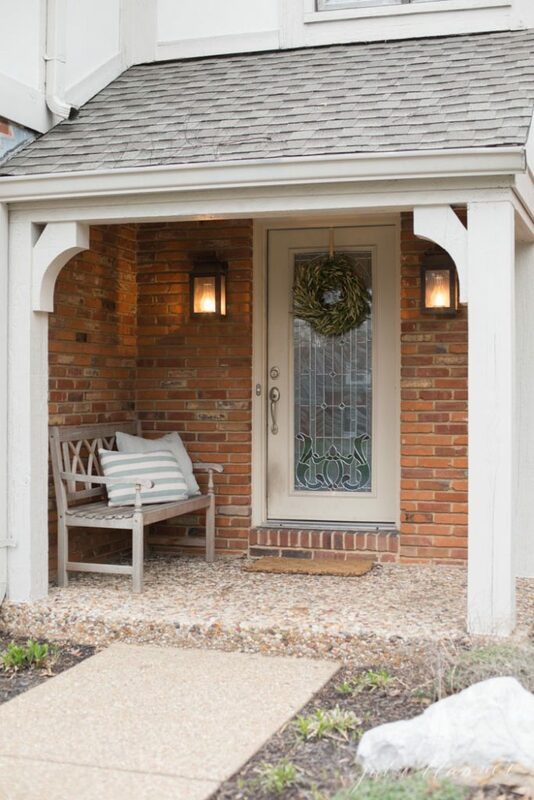 I’ve been looking for a brick floor for a while and I love what you have in your entry. Can you tell me what it is and/or where you purchased it? Absolutely! You can find all of the details here and here. 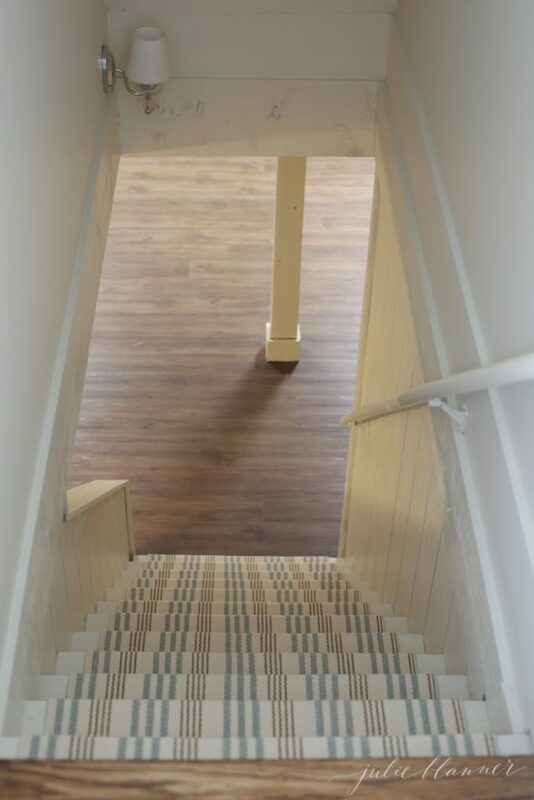 Can you tell me where you purchased your beautiful basement stair runner? You can shop all of our home decor including the rug in my shop. Enjoy! Your home looks beautiful, as always. I love your little olive trees. Are they difficult to care for? I am pretty successful with plants; I have a clover that was given to me by a former boss for St. Patrick’s Day over twenty years ago. It still looks lovely! Thanks, Joan! Because they live in dry climates, I think so. I water mine 1-2 times a week and they do really well. Clovers are SO easy and forgiving. I love their beautiful blooms, too! Pretty impressive you have maintained it for 20 years!